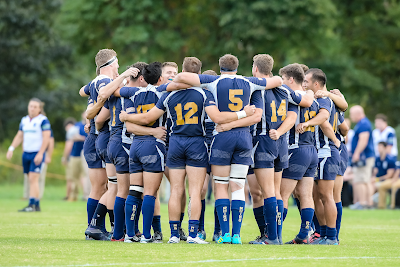 On Friday, September 21st, the Navy First XV took on the varsity Mary Washington First XV. The home crowd turned out in large numbers to support their team, and the game-day atmosphere was electric. Navy entered the match with a 2-0 record, and Mary Washington was 1-0 going into the game. Friday’s match was a hard-hitting display that pitted two very physical teams against each other. Navy had several opportunities to score in the first twenty minutes, but lost the ball each time within Mary Washington’s five meter line. Mary Washington used this to their advantage, and got on the scoreboard first, in the 20th minute, with a try out wide and a successful conversion. Navy continued to move the ball, but still had trouble coming away with points in the first half. Mary Washington capitalized off Navy’s errors, and scored again from close range in the 39th minute. Going into the half, Mary Washington lead 14-0. Navy kicked-off to begin the second half, and upped their intensity and speed of play. Some key linebreaks by Navy’s 8 man, Spencer Craig, began to turn the momentum in the game. Andrew Malick scored in the 46th minute of play - and then kicked the conversion himself - to make the score Navy 7, Mary Washington 14. The Midshipmen continued to fight back, and brought the score closer with an Erick Bleakley try in the 59th minute. Some hard-nosed running by junior prop, Bo Kendrick-Holmes, led to the try. The score was then Navy 12, Mary Washington 14. As the momentum shifted in Navy’s favor, the crowd rallied behind their team and made their presence known. A high-tackle in the 68th minute on Navy’s Andrew Malick led to a penalty to the Midshipmen. Navy captain, Michael Samaniego elected to kick for points. After shaking off the infringement, Andrew Malick split the uprights from 20 meters out to put Navy ahead 15-14. Navy had a few more opportunities to score in the remaining minutes of the game, but could not capitalize. Mary Washington fought hard, and the game went down to the last minute. Just when it looked like they might break a long run off a set piece, the Mary Washington fullback knocked the ball on. The referee blew the final whistle, and Navy came away victorious. It was a thrilling game, and both teams left it all on the field. The Navy First XV will take on the Norfolk Blues next Saturday, September 29th at 2 p.m. at the Brigade Sports Complex in Annapolis, Maryland. The Navy Rugby program showed their depth as their second and third sides came away with big wins on Saturday, September 22nd. The Navy Second XV defeated Delaware’s First XV 82-5. Navy’s Third XV defeated Delaware’s Second XV 91-0. Both Navy teams looked strong. The program certainly looks to have a bright future. Navy’s Second XV takes on VMI First XV on Saturday, September 29th at 12 p.m. Navy’s Third XV will play Old Dominion University’s First XV at 11 a.m. Both games will be played at the Brigade Sports Complex in Annapolis, Maryland.